Ensaladang Bulaklak ng Kalabasa. 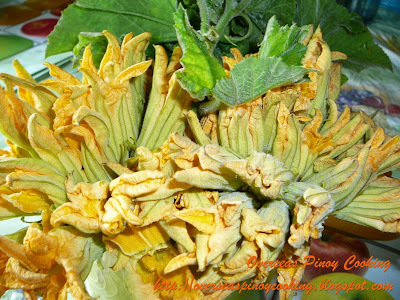 Bulaklak ng kalabasa or squash flowers. These colorful vegetables flower are one of my favorite vegetable. 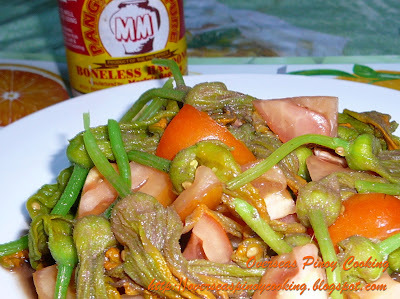 It can be one of the ingredients of the popular dinengdeng or cooked as guinisa. Because of their bright yellow orange color they are visually appealing and they are best cooked as salad or ensalada. It is easy to prepare just blanch the flowers in boiling water for a minute or two. Here is how I made it, similar to my previous post of ensaladang katuray.